Students in University Honors Program help each other to grow personally, professionally, and academically. The program starts with highly motivated students living together in the honors halls. Then in weekly small “family” groups, led by their mentor, they support one another as they go through challenges of their first year. By the end of the year, students are able identify personal values, what they need to push themselves to towards excellence, and how it all fits together with their long-term goals. 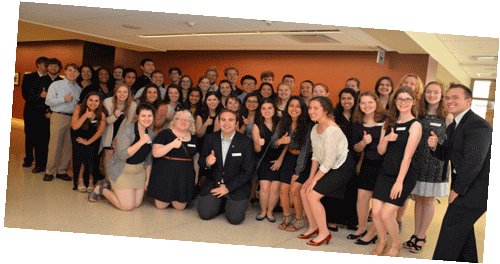 Choose Honors Housing Community as your first LLP preference. Our program consists of small, peer-mentored “family” groups, a one-hour weekly seminar, and a vibrant and supportive shared living experience. Articulate a goal for life after college and identify the courses, extra-curricular experiences, and leadership roles that will help you work toward that goal. Honors Housing Community program administrators assign participants rooms. This assignment process intentionally clusters students by major and other criteria. This assignment process has been successfully utilized for over 30 years.